How do you take care of your hair? Me, bad, very very bad.. I know there's something wrong with my hair. It's falling out and very dry in the bottom but I don't have much time to give it extra treatment. I think my hair hates me a lot! So, I was so glad when getting an invitation to Kérastase Grand Crus Blogger Experience last Wednesday, May 9th. I've never tried any Kérastase products before but I know they are awesome. I was so excited! They only invited 5 bloggers if I'm not mistaken.. including me, Carnellin and Hanna. 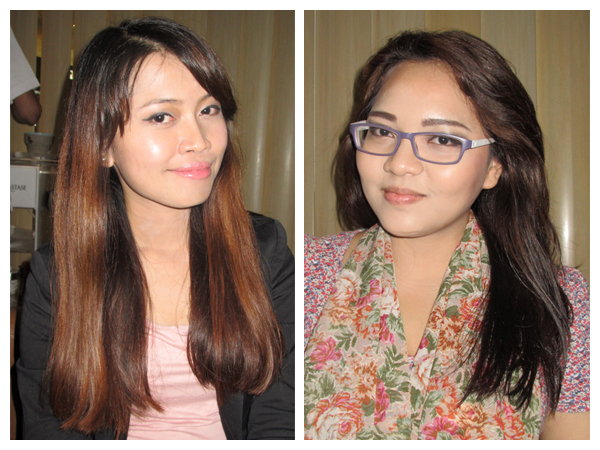 Before the treatment begins, we had lunch at Palalada Restaurant, Alun-alun Grand Indonesia. Kérastase team introuduced Kérastase Elixir Ultime Grands Crus to us. It has 4 different types of textures and 3 new fragrances. 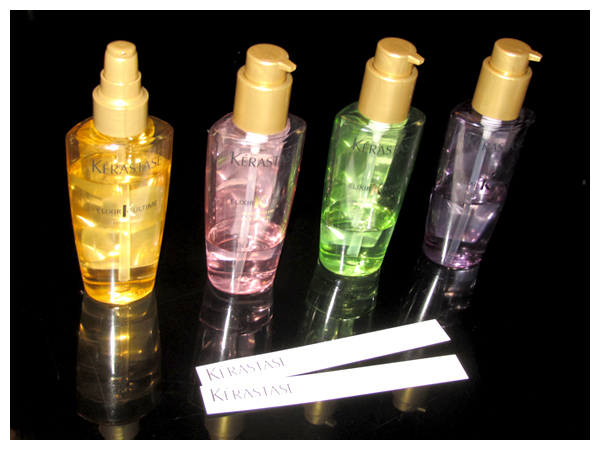 From left to right: The original Gold, Rose Millenaire, Moringa Immortel and The Imperial. Just like perfume, we can choose one of them base on our mood that day. We can also mix it up to get a new fragrance! ^^ I will explain the detail later. 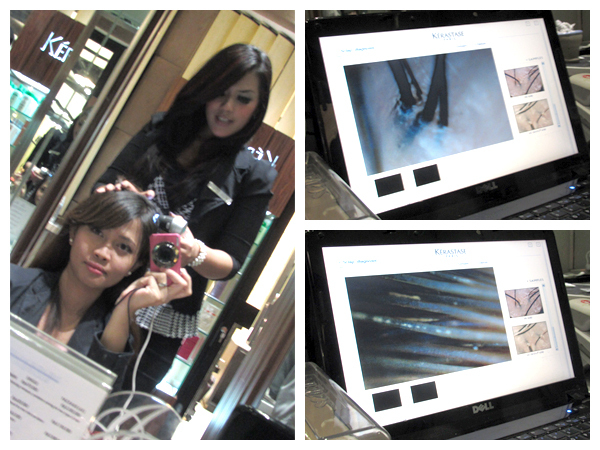 Then we're ready to experience the new 24 Carats Ritual at Kérastase Institute, inside Irwan Team - Grand Indonesia. Let's take a look at the pictures, in case you want to feel this experience too ^^. 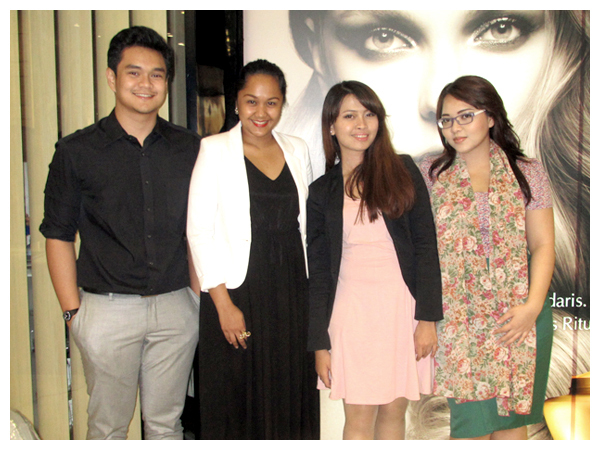 Posing with Kérastase team before being pampered at Kérastase Institute.. This is me and Hanna before treatment. We want to know if there will be a significant difference afterwards. 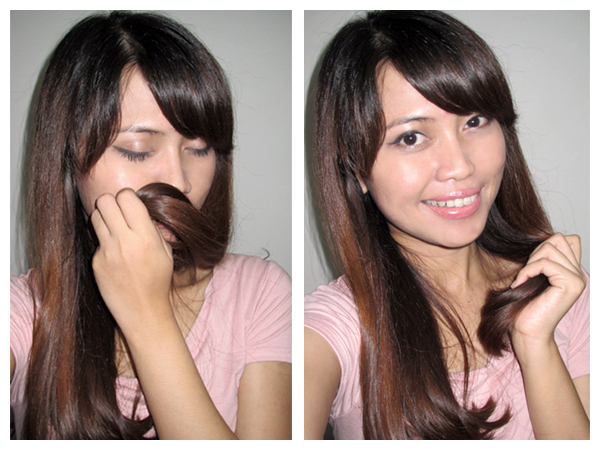 Look at my hair, the color has faded but I'm too busy to dye it again (U_U"). She said basically my hair is healthy. You can see at the picture, it grows 3-4 strands in a root but the bottom part is lack of nutrition so looks stripey. I also told her about my hair loss, especially when I'm shampooing. She told the salon attendant that I need a treatment for normal hair with hair loss problem. 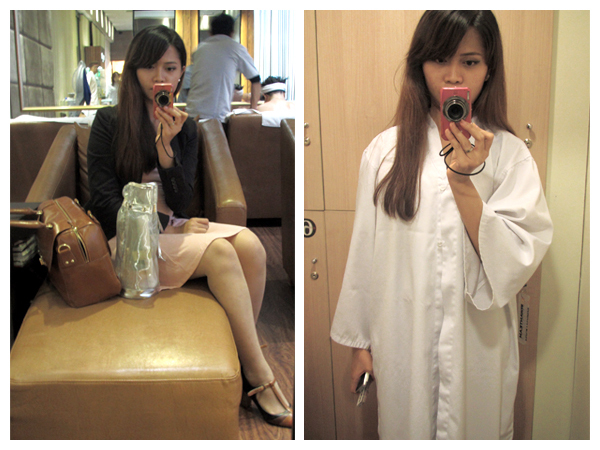 Then I had to change my clothes with a bathrobe. They provide a secure locker to put our goods. 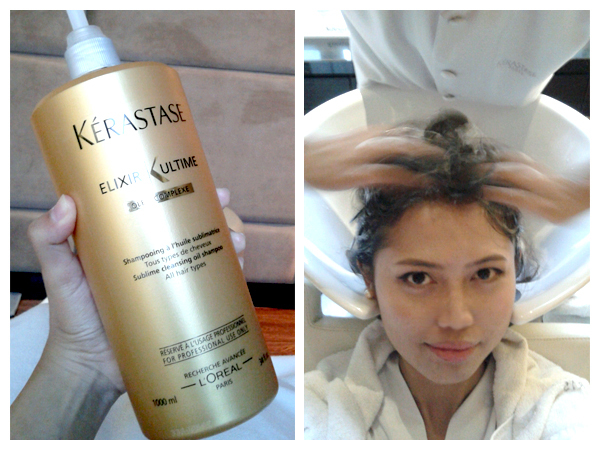 The first thing to do was giving my dry hair the original Gold Kérastase Elixir Ultime Grands Crus and massaging my scalp. 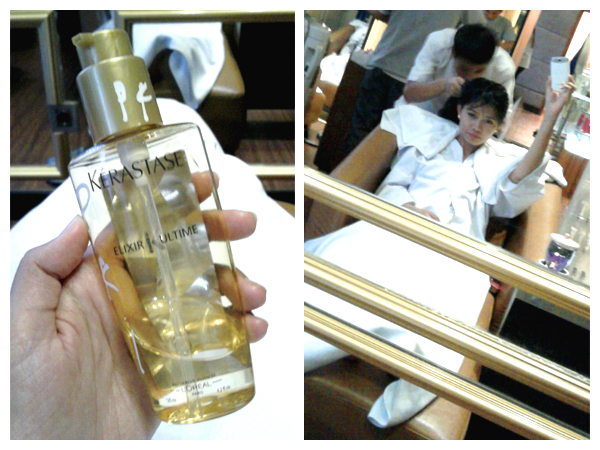 After that, my hair was washed with Kérastase Elixir Ultime Shampoo. I really love the fragrance, so mild and nice! 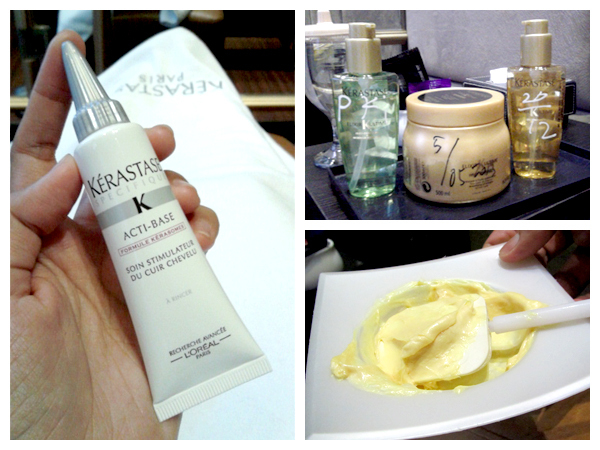 Then the salon attendant applied Kérastase Specifique Acti-Base to my scalp and massaged until it's absorbed. He massaged my back and hands too with hot stones. You know what? 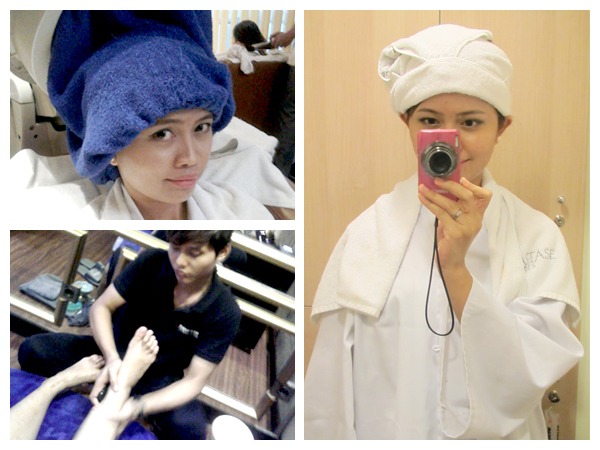 The last time I had a body treatment at salon was before my marriage, which is more than a year ago! *Where have you been Carryn!? So, I feel soooo… happy and relaxed! It feel so good! 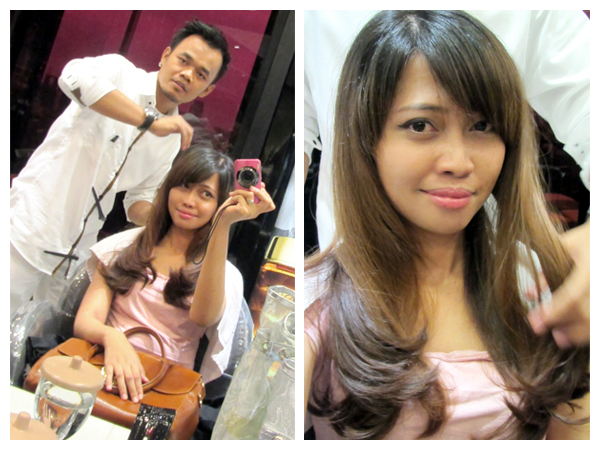 After all the hard work, a busy woman deserves a good hair & body treatment! Indeed! Haha..
A few minutes later my hair was washed again to clean up the mask. Then the salon attendant applied hair tonic using a tool which looks like a comb. 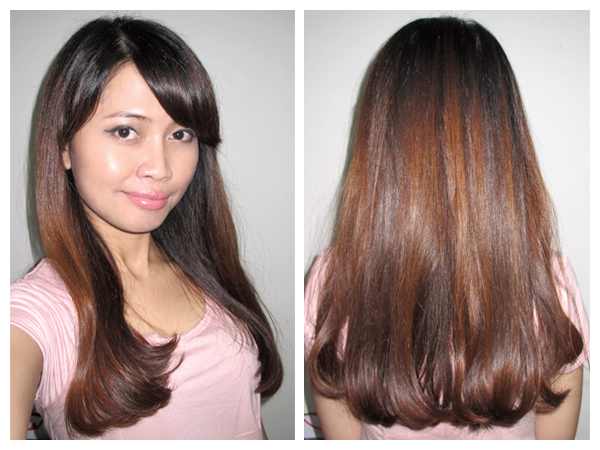 You can get it for free if you buy a box of Kérastase hair tonic. 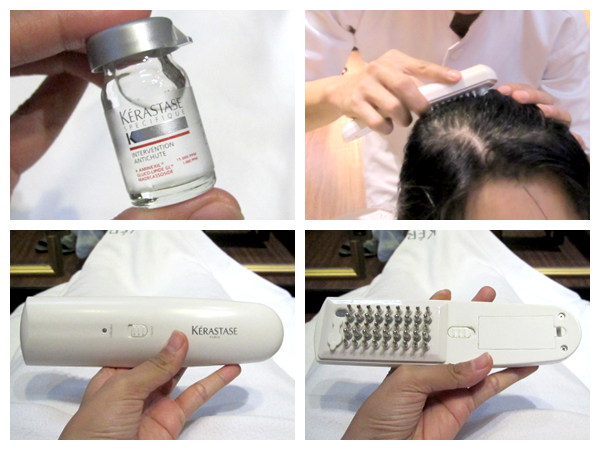 It's so easy to use, just like combing our hair with a little pressure until the hair tonic absorbs perfectly. My impression of this treatment is.. So.. Good!!! My body feels good, my legs feel good. and my hair feels awesome! It feels light, fluffy and smells sooo… good!! I really love my day! 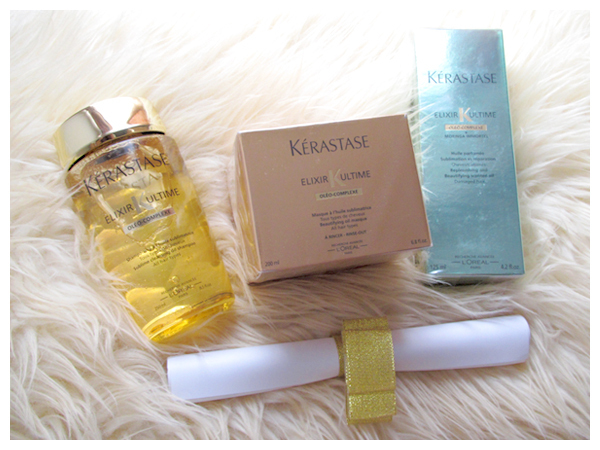 3 Kérastase Elixir Ultime products: Shampoo, Moringa Immortel Grands Crus and Hair Masque ^^ I'm going to review them soon! yaampun gendot banget guaaaa! 15 kg to goooo lah ini ceritanya! Rini> Iyaa.... XD Harus sering2 diblow ini berarti.